Well, even though its only been a few days since three Cedarbrookers landed on European soil, there have already been enough experiences to fill quite a few pages! Please allow me (Dave) to give a few highlights! We landed in Prague, Czech Republic on Friday morning (March 23). My dear friend, Marek, met us and treated us to a quick tour of Prague and a great lunch. We walked over the 900 year old Charles Bridge and took pictures in the narrow, winding, cobblestone streets of the "Little Quarter." From there, we boarded a train at the main train station for the 3 hour ride to the city of Ostrava, where we were met by my friend, Petr. The biggest challenge for all of us was keeping each other awake for the 3 hours ... (after being mostly awake for nearly a full 24 hours! We arrived safe and sound in the town of Frydlant nad Ostravici just in time for supper at the Hotel Malenovice (click on the name to go to the link). After a great night's rest and a wonderful Czech breakfast (and plenty of strong coffee), we had a look at the building site, and worked for a number of hours preparing for, what we hoped would be Monday's work. During lunch, we were invited to join a group of Czech young people and their baseball coach for a 9 inning game of softball. This scribbler (Dave) declined, due to having rotator cuff surgery in December, but Todd and Clint jumped at the chance. The game was fun and filled with some really good "form" ... as you can see from the pictures! Sunday we had a great relaxing "Sabbath rest" ... including a couple nice walks. The afternoon walk was from the hotel down to the town for a 4 o'clock service. The walk was about an hour! But, the weather was beautiful and we enjoyed the service! Fortunately for Clint and Todd, a great young man, Matej (Matt) translated from Czech into English. Monday we started on our first "project" ... not exactly what we planned, but, oh well ... in the missionary world the best word to know is "flexible!" ... we worked on re-staining boards in the ceiling of the cabin that had been built a year ago. Because of the wood not being completely dry, and shrinking over the last year, there are many "white stripes" that need to be stained. Todd found a great way to get the highest point of the ceiling! Monday is drawing to a close, and we're ready for a good night's rest in anticipation of what ways God will use us tomorrow to encourage people here! Today we are super excited as we embark on the latest leg of our journey of faith and service! Tomorrow afternoon 8 of us will begin the long journey "down the Mississippi!" to New Orleans! We're taking 6 University of Wisconsin - Eau Claire students with us for a week of serving in the inner city with Urban Impact (www.urbanimpact.org). 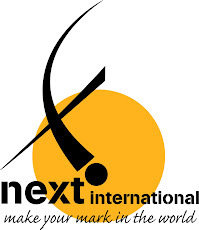 Our non-profit, NEXT International, has been invited by Urban Impact, a partner organization in New Orleans, to help "create a neighborhood where its safe for kids to ride their bikes!" WOW!!! ... It doesn't get any better than that! We will be working on renovations of the new neighborhood outreach and ministry center in the Central City area of New Orleans! We're anticipating a super fun and life-changing 9 days! And ... oh, wait a minute! ... this is just in! ... the trip to New Orleans ... well ... that's not all!! Then, on March 23rd, Dave will be landing in Prague, Czech Republic with two other workers where we will travel to "the Eastern Front" and spend a week working with our Eastern European partner, Josiah Venture (www.josiahventure.com). In a region where less than 1% of the people know God in any sort of personal way, we feel privileged to help with facility expansion and improvements, knowing that God will use those facilities to help touch the lives of those who stay there for conferences and retreats. Please pray for all of us as we go and serve! Watch for updates here and on our Facebook page!